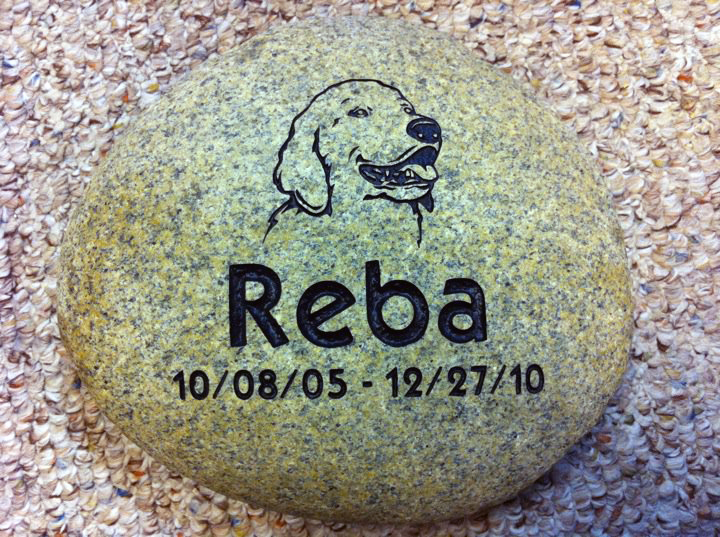 It's been a year since Reba, our Golden Retriever, passed away. It feels like it happened just yesterday. She was the first female dog my family had and our second Golden Retriever. Cody was her best friend from the very moment we brought her home. 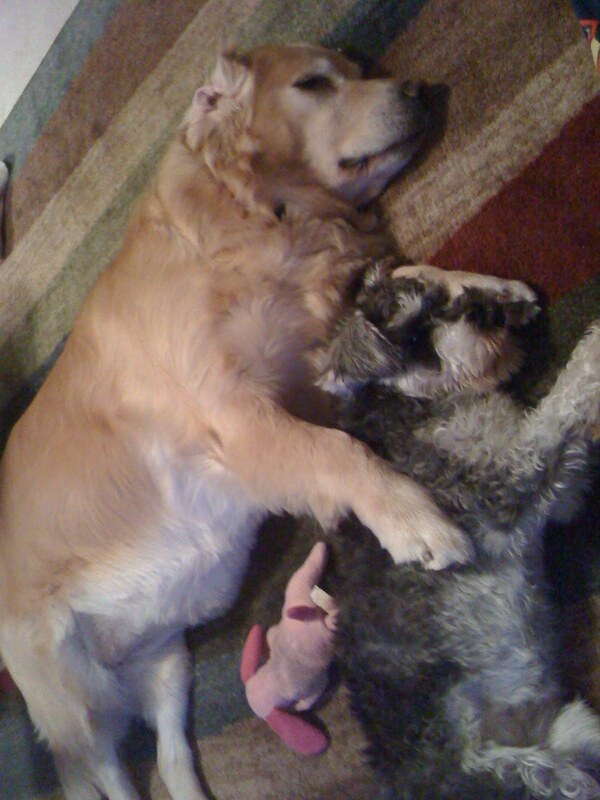 When we brought Sophie home in 2009, she and Reba got along just fine. 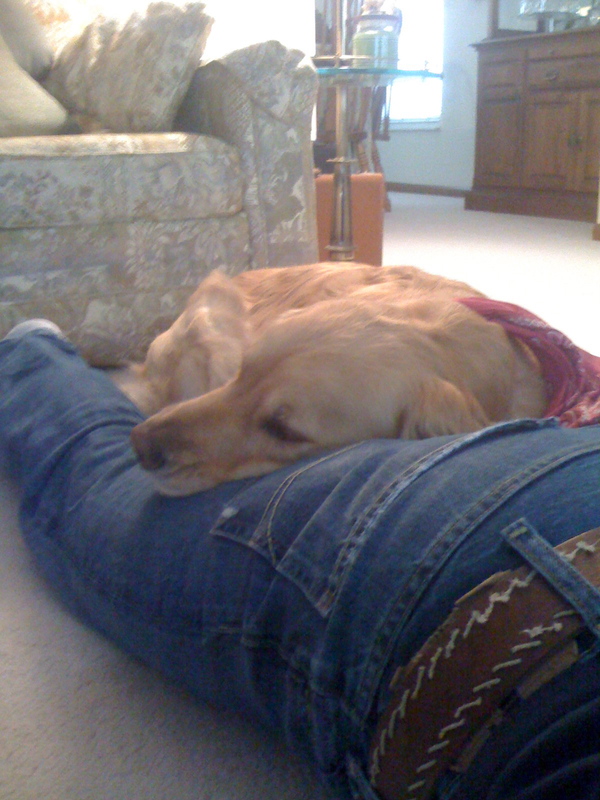 She loved to sleep between my legs while I was lying on the floor doing my homework, and she always found Cody as a comfortable headrest. This was her "pet me" pose. Out of all the dogs, she was the only one that would actually fetch the ball. Cody would just run and pick it up, and Sophie would just run, but Reba always brought it back. In the beginning of December, Reba had been vomiting for about 24 hours, and concerned, we took her to the vet the next day. He did some x-rays and saw some foreign objects in her intestines. One surgery later, the doctor found a twist tie, dental floss, and a broken Christmas ornament inside her. He stitched her up, expecting the removal of the foreign objects to make her better. She wasn't any better a week later, so the vet did a second surgery. After some invasive incisions, he found that her intestines were adhering to each other where the ornament had cut her. He had to remove 4 inches of her intestines, thinking that would fix everything. About another week later, Reba's incision wasn't healing, so we took her back to the animal hospital, and she was severely infected. The vet put her on heavy antibiotics and tried several other things, but nothing worked. On December 27, 2011, we went to see her, and she was worse than ever. She was so skinny that we could see her ribs, and her incision was leaking fluids. Despite all this, she still managed to wag her tail for us. We decided as a family that we had to put Reba out of her misery that night. We fought for her life, and she was trying her hardest to survive. But, even if she did survive, her digestive system would never have been the same and Reba would never be herself again. Reba was the first dog I ever had to experience losing by death. When I was younger, we had to sell our dogs when we couldn't keep them anymore, but that was nothing compared to this. She was only 5 years old, and would have lived a lot longer if she wouldn't have eaten that Christmas ornament. It was so random, too, because she would never eat anything weird like that. She didn't even chew on shoes. It came so unexpectedly.